For the usually slow moving large building automation industry, the latest XML (extensible markup language) / Web Services movement has been a bit of a blur, spawning a number of dot coms and dot orgs to share information with our industry. The purpose of this article is to provide you history, connection and insight into these valuable resources. I first heard about web services / XML at the AHR Expo in Atlanta 2001 in a brief meeting with Eric Craton and Steve Tom of Automated Logic, held in the hallway of the convention centre. Eric explained his vision of how web services would change everything. I can still see the excitement in his eyes. As I grasped what he was talking about my excitement also started to build. Eric warned me that all this stuff was pretty bleeding edge and many conventions needed to be established by the IT industry to make it really useful. Automated Logic's early entry into web-based control with a full java platform allowed them to provide a strong lead in how web services might unfold. In January 2002 Eric helped me create a web services forum on our AutomatedBuildings.com web site. Below are the opening remarks. It is hoped that this starting point and our linked resources will open the industry minds to the importance of opening dialog now on how an Industry Web Services Information Model could evolve. The task of creating a Web Services Information Model or Models is important to us as an industry. If we do not take control of the data presentation of our dynamic information, the Information Technology or IT Industry will. It is important that our solutions seamlessly mesh with the IT industry, but it is even more important as an industry that we control the content and interaction of our information model or models. This article by Eric and Dave provided the corner stone of our web services forum. This great blueprint for the industry was a harbinger of change and at the AHR Expo 2002 in Atlantic City I met with Paul Ehrlich of Trane. Paul explained his vision for his Company of building product based on web services and how industry standards were required for this to happen. Committees and organizations larger than our present industry would be required. My optimistic goal was to have a web services XML demonstration for the Chicago AHR Expo. This did not happen although much progress was made and a committee was formed with Paul as the Chairman. The politics of which industry organization this committee should belong to was amazing. The web services concept was much larger than all of our traditional organizations as it involved many other industries such as lighting, security, etc, as well as the IT industry. Paul and his committee chose to work with CABA the Continental Automated Buildings Association. CABA provided shelter from the political storm by providing a non-HVAC organization that crossed over several major related industries such as Lighting, Security but still had a strong connection to ASHRAE. http://www.caba.org/aboutus/mission.html One of their objectives is to facilitate and encourage industry-wide interoperability of protocols and standards. The committee evolved well in this transition space and created the industry's first Guideline for XML / Web Services for Building Control. Building Controls to utilize the infrastructure of their existing intranets and Internet. Controls as a data source to help them better run their business. Systems that follow the same standards as other IS and IT devices. This open letter to the industry ended with - An initial meeting to gauge interest and begin planning will be held at BuilConn in Dallas on April 23rd, 2003 from 1:00 - 3:00 PM. I attended this meeting and was amazed at the interest of the audience plus the depth of industries represented. The meeting had not only great physical attendance but also a good representation by conference call. The complete group got it, moving ahead in today's market is going to require working as a team. The committee was given a clear vote of confidence to keep moving ahead as fast as possible. It was clear that all industries were using XML and web services and all agreed that guidelines were required. Why was it done at BuilConn? It was the only event focused on integrated and networked building systems for contractors, dealers, and systems integrators. The next meetings were in June during Realcomm in Chicago and then at the BIG-NA conference in Cincinnati. 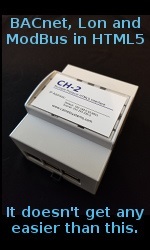 Anto Budiardjo, Clasma, Inc. wrote an article capturing the feeling of the second event. He stated ...all that negativity seemed to have been shattered and replaced with a level of camaraderie that may just propel us towards a real open approach to building systems - an open mindset approach! For those who don't know what oBIX is, it's the new identity for the work being done by the CABA-initiated XML/Web Services Committee and stands for Open Building Information Xchange. The group initially met in April during BuilConn and again in June during Realcomm in Chicago. So, this group is now six months old, and it's been christened with the name oBIX. Legally speaking, oBIX is the name of the resultant work. Keith E. Gipson, CEO & CTO Impact Facility Solutions provided more insight. In this article, A report from the BIG-NA conference; BACnet, IT and XML are hot items. This is where XML comes in. XML is a machine-to-machine, communication protocol that is in use by many non-HVAC vendors today. Lots of good work has already been done by ASHRAE and the building controls industry at large and XML will not replace BACnet. 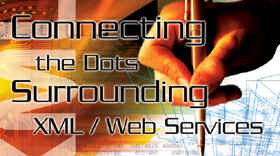 However, what's needed right away are XML / Web Services functionality. There is a committee that met during the BIG-NA conference called OBIX (Open Building Information Exchange). The OBIX committee has a goal to move fast to create a non-binding guideline for the implementation of Internet standards for interoperable Enterprise Facility Management. In conclusion, what is XML? XML is the easiest, fastest and best way for vendors to expose extended functionality in their Building Controls Systems. There may be a whole "laundry-list" of functions that could eventually be developed, there are many different syntactical considerations, but start-off by giving us all the "GetPointData" web-service. There are many people out there who are ready to put it to good use, for the benefit of their customers. Ehrlich: Let's start with HTML. HTML is an Internet protocol all about controlling the display of information on Web pages such as this article. HTML deals with the size of text, font, color, display of pictures as well as hyperlinks. In contrast, XML is a protocol about raw data. It does not concern itself with display attributes, so a piece of XML information would simply say that a temperature is 72�F. It will be up to the recipient to decide what to do with that data. This makes XML ideally suitable for machine-to-machine communication whereas HTML suits machine-to-human. 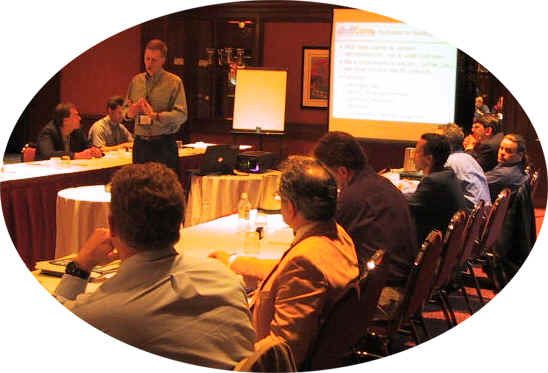 oBIX began its life in April of 2003 as the CABA XML/Web Services Guideline Committee. Since then oBIX has taken on a life of its own with an expanded mission and increased visibility. The following news release announced the well attended first ever XML symposium held at Anaheim Hilton Hotel. This groundbreaking event reconnected the fast moving XML folks with the ASHRAE organization. The ASHRAE folks had a large presents in the symposium and told how they were using XML to create better engineering tools. A real eye opener for all involved. OTTAWA, ONTARIO-CABA (Continental Automated Buildings Association) and Clasma, Inc., a specialized event and marketing firm for the building systems industry, announced the co-production of an XML Symposium with a focus on delivering a high-level, introductory perspective of the role of XML and Web Services to the HVAC industry. The XML Symposium will be held on January 27, 2004 at the Anaheim Hilton Hotel and will be in conjunction with the AHR Exposition. The AHR Exposition is being held January 26-28, 2004 at the Anaheim Convention Center. Widely used by the IT community and considered by many as the most important enabling technology for the future of integrated and intelligent buildings, XML brings to fruition the convergence of building systems and the IT infrastructure. These IT-based technologies are drastically changing the buildings industry as they enable cooperation between disparate approaches to open systems, a vital issue within the industry. "As possibly the ultimate integration mechanism for buildings, XML will revolutionize the buildings industry," Ron Zimmer, CABA President and CEO, said. "This symposium will provide the HVAC professional with ample XML and Web Services education and a practical expectation of their adoption rate within the industry." At the time of preparing this connection of dots I am planning for BuilConn 2004. The XML Pavilion at BuilConn is a key element in developing the market's understanding of XML and Web Services. The pavilion, a part of the Expo at BuilConn, will consist of approximately a dozen companies that are actively working on XML and Web Services products and solutions. They will come, plug their prototypes or finished products into the Internet and show BuilConn attendees how XML actually works. We are excited about what this year's BuilConn will uncover as we all explore how to enter the enterprise gracefully and see the next chapter of XML/Web Services oBix unfold. We will be continuing to inform you of the evolution of XML / Web Services and bring you the summary of the next chapter as it unfolds at the BuilConn event in our August ES Supplement titled "Connecting Convergence".